I have used the Swagger UI to display my REST webservices and hosted it on a server. However this service of Swagger can only be accessed on a particular server. If I want to work offline, does anybody know how I can create a static PDF using the Swagger UI and work with it? Additionally a PDF is easy to share with people who don't have access to the server. Used Swagger 2 to implement documentation. You can modify your REST project, so as to produce the needed static documents (html, pdf etc) upon building the project. If you have a Java Maven project you can use the pom snippet below. It uses a series of plugins to generate a pdf and an html documentation (of the project's REST resources). The war plugin works on the generated documentation - as such, you must make sure that those plugins have been executed in an earlier phase. While Amaan Mohammed's solution looks like it will work, there is an easier way to do this. Take a look at swagger2markup-cli. For me the easiest solution was to import swagger (v2) into Postman and then go to the web view. 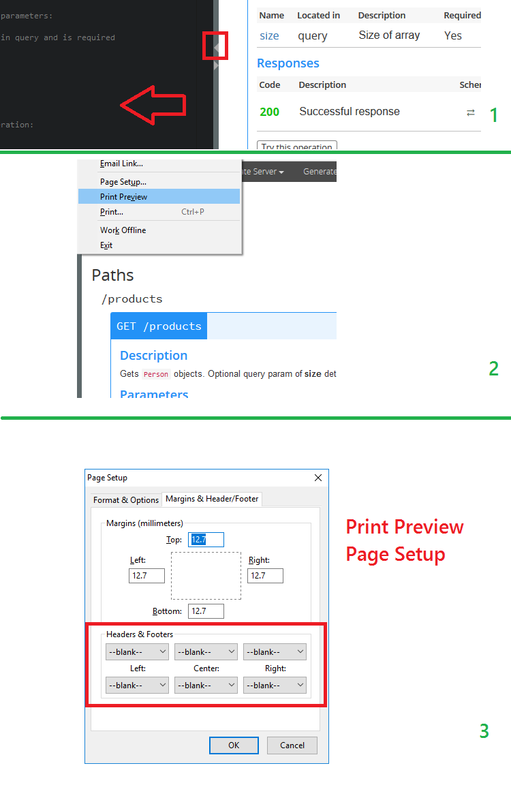 There you can choose "single column" view and use the browser to print to pdf. Not a automated/integrated solution but good for single-use. It handles paper-width much better than printing from editor2.swagger.io, where scrollbars cause portions of the content to be hidden. Not the answer you're looking for? Browse other questions tagged pdf swagger-ui or ask your own question. How is it possible to generate a pdf of swagger data? Is there a public website that converts swagger json to PDF for HTML? is it possible to get an offline version of swagger documentation for a website? How can i convert a swagger.yaml file into a pdf?